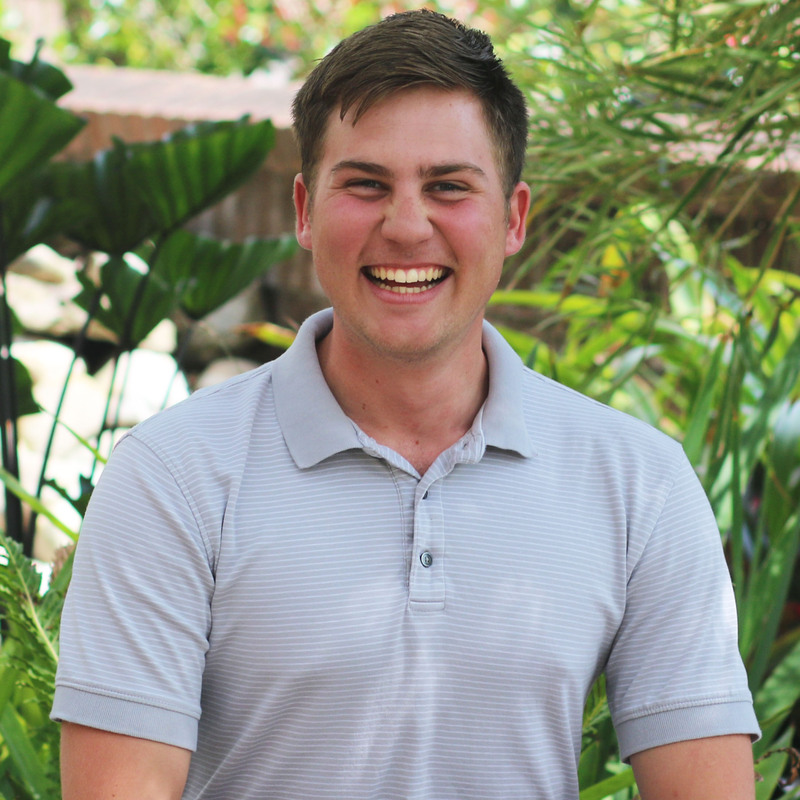 Meet Forrest, a junior studying civil engineering, an Honors Orientation Peer Ambassador, a PLC Member for the 2018-2019 year, and a member of the Marching Knights. “My first visit to UCF was during high school. I came for an All-State Preparation Clinic, which is a clinic for tips on how to better prepare for the audition for All-State, a band for the entire state of Florida. The Marching Knights were there performing. We all got to see a preview for their first show of the year. It was really cool to see them up close! We were 20 feet away from the entire band. You could just walk up to one of the band members and start a conversation with them. This experience showed how important the community is within the Marching Knights. 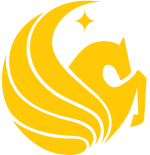 Even though UCF is a huge school, everybody tries to make you feel as included as possible, which solidified my choice to come to UCF. I was set on joining the Marching Knights when I came here freshman year. All I had to do was turn in my “Intent to March” form and my uniform measurements. It’s an easy process! 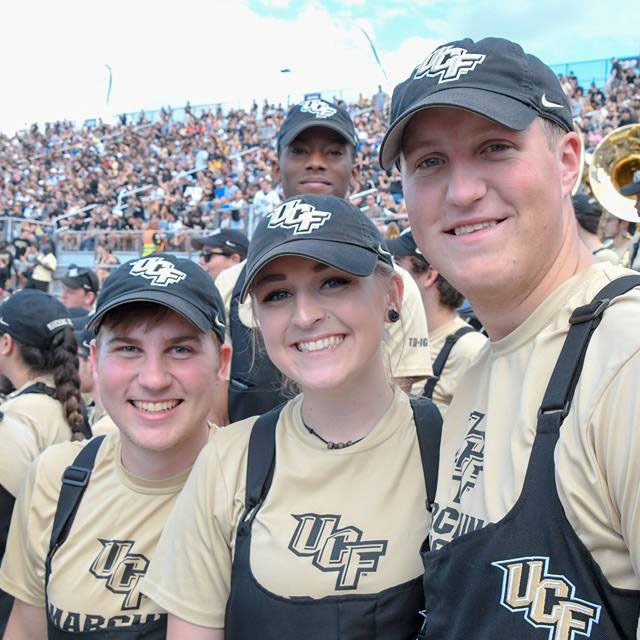 At orientation, you sign up for the course associated with Marching Knights. From there, you show up for band camp the week before the fall semester starts. 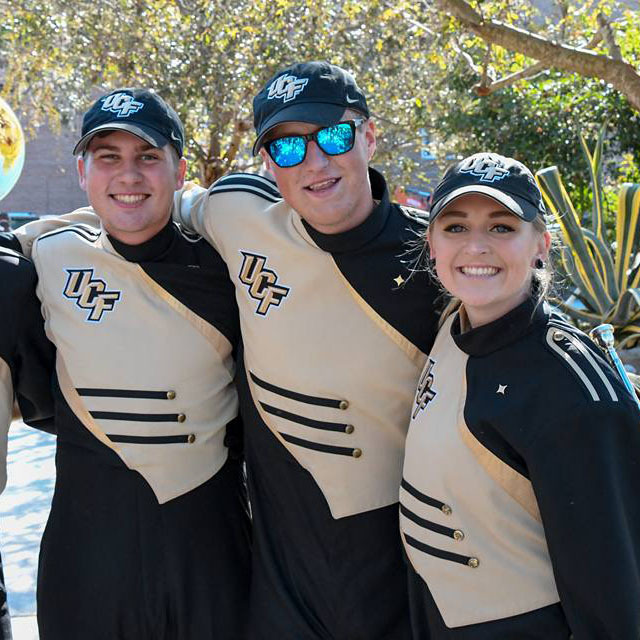 The nice thing about UCF, and a big part of our culture within the Marching Knights, is that we don’t audition. To just be a member of the band, you just show up and do your best. We play at all of the pep rallies and the football games. There are 320 of us in Marching Knights. We’re the biggest student group on campus. You don’t know every single member. 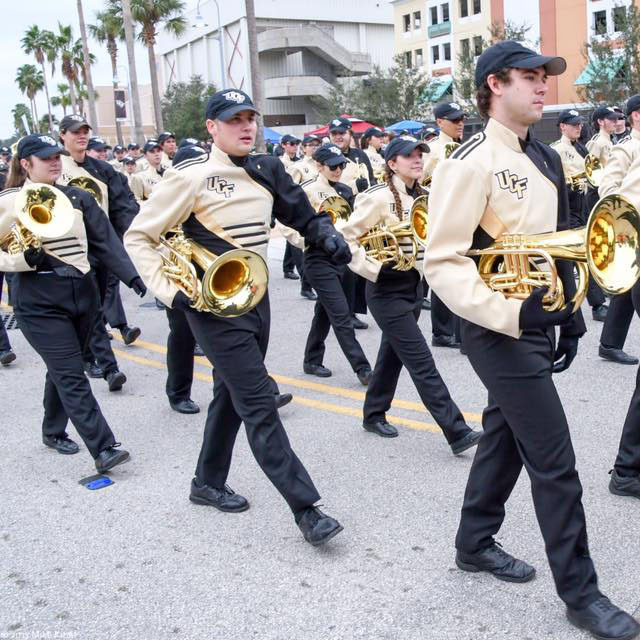 But, you do have that commonality of working toward the goal of being a Marching Knight and representing the school. You work a lot with your specific section, which is based off of the instrument you play. My section, the baritones, is pretty small. We have about 15 people a year. We become really close and like a family. I consider my section to be my family. You work with them every day, you have sectionals with them, and you’re with them all of the time. Community is very important. We still hangout even when we’re not in season. We all root for each other and it’s really great to have that support. My favorite memory with Marching Knights was definitely getting to play at and attend the Peach Bowl in Atlanta. The whole trip was great! Three days before the game, we all made our way to Atlanta. We got to explore the city, which was a lot of fun. The game was just wild. We were cheering on the football team the whole time. As the game went on, it seemed more and more likely that we were going to beat Auburn. When we actually won, I was so excited. I lost my voice from cheering. The trip really showed me what you could do under great leadership and the drive. My first year performing for the Marching Knights at football games was quite the opposite experience… we were 0-12. It was cool to see that transformation from my freshman to my junior year.